Paul Bird got his BTRDA Gold Star championship of to a flying start by dominating the Weir Engineering Wyedean Forestry Rally in Chepstow at the weekend. Bird, with regular co-driver, Aled Davies back beside him took the lead on the second stage and never looked back as he managed his lead over the next seven stages to win by an eventual 34 seconds from Dave Weston Jnr in a Subaru. Brian Bell Made his return to rallying after around 7 years out of the sport. He set some respectable times throughout the day whilst still getting used to the Ford Focus 08 spec WRC which is definetely alot different to the his old 2002 specification Ford Focus. A rise in temperature on the week leading up to the event saw the frost deep in the ground on the stages rise to the top. This coupled together with a full afternoon of heavy rain on Friday saw very tricky conditions in the morning. The opening two stages were 3.2 miles through a very slippy Blaize Bailey before over 10 miles through Speech House. Paul Bird’s plans to test through the week fell through so he had not driven the car on gravel since the end of 2014. He set second fastest time some 11 seconds behind the Fiesta of Charlie Payne then there was only 10 seconds back to seventh. It looked like it was to be a tight battle all day but this would change on Speech House as Bird blasted his Fuchs Silkolene and Frank Bird Poultry backed Focus through the 10 miler 12 seconds faster than second fastest Weston and 26 seconds faster than early leader Payne to give him a 15 second lead after 2 stages. Brian Bell was back in the BTRDA after more than a few years away from the series he so hotly contested in the 90’s. A previous winner of this event in 1999 he was looking forward to getting out on the stages but the new car would take alot of getting used to for a man who hasn’t even driven a rally car for over 7 years. On the very slippy Bailey Blaize he had a small spin with a stall also but on the next stage he got a clean run and was 22nd fastest which gave him some confidence in the car. 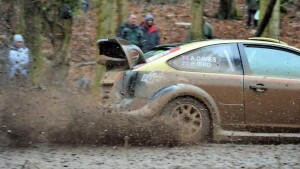 There was two more stages totalling almost 8 miles before service and Bird and Davies were on top form now. They won both of them and held a healthy 21 second lead over Dave Weston Jnr at service with Charlie Payne 28 behind and Hugh Hunter 45 seconds of the lead. Bell had another couple of stalls on the third stage but a clean run through the fourth to sit in 25th overall at service and thouroughly enjoying his first run in the new car. British Superbike team owner, Bird swapped fastest times with Weston on the next 2 stages so it was as we were at service with Bird leading by 21 seconds with two stages to go totalling around 10 miles. Weston had to go for it, Bird on the other hand just had to control the gap and not make any mistakes. It was the latter who succeeded though with second fastest and then fastest on the final stage to win by a convincing 34 seconds and get his championship off to a great start. Bird commented at the only main service of the rally at midday that he couldn’t remember the last time he saw as many spectators out on the stages which shows just how good the competition and publicity that the BTRDA championship has. Bell, with Matthew Whattam on the notes set some good times on the 2 stages after service which saw him climb up to 22nd in the Bell Leisure backed Focus WRC but a puncture on the next stage dropped him over a minute to those around him at the time and he dropped back to 30th. A steady run through the last stage so that he got to the finish saw him finish up in 32nd overall and with a big smile on his face after a very enjoyable return. The next round of the championship is on 7th of March and it’s one of Bird’s local events and on that he won last year – The Malcolm Wilson Rally in Cockermouth. Both Paul and Brian’s car will now undergo all the usual checks to ensure they are ok and ready to go for 7th of March.